NewMexico?s Spaceport America has reached a key milestone on its road to becomethe future home for Virgin Galactic?s suborbital space tourism spaceliner fleetand other launch firms. The NewMexico Spaceport Authority (NMSA) announced Monday that it received a licensefor verticaland horizontal launches from the Federal Aviation Administration?sAssociate Administrator for Commercial Space Transportation (FAA/AST). The FAA/ASTissued the license after providing a vital Environmental Impact Study Record ofDecision required for construction to begin on the sprawling spaceport. New Mexico?sSpaceport America is billed as the nation?s first ?purpose-built?commercial spaceport. The site is 30 miles (48 km) east of Truth orConsequences and 45 miles (72.4 km) north of Las Cruces. 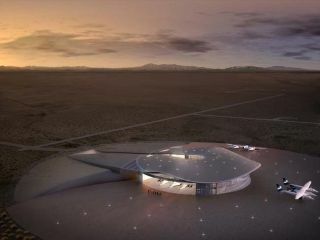 There havebeen a numberof political hoops to move Spaceport America closer to reality. Forexample, the New Mexico State Legislature set certain requirements forspaceport funding, which included the formation of a local tax district, theissuance of an FAA Environmental Impact Statement record of decision and launchsite license, and a signed lease agreement with an anchor tenant. Roadwork tothe spaceport is already underway, and the architectural firm of URS/Foster +Partners is completing their final design for Spaceport America?s terminal andhangar facility. SpaceportAmerica is expected to cost a total of some $225 million to construct. Accordingto NMSA Executive Director Steven Landeene, all is now on track to startspaceport construction in the first quarter of 2009. Furthermore, the NMSA isexpected to have a signed lease agreement with Virgin Galactic later thismonth. ?A few issues remain that are being worked. We anticipatelease signing prior to the end of the year,? he told SPACE.com. Virgin Galactic is offering seats atthe going rate of $200,000 per person onboard the now-in-development WhiteKnightTwo/SpaceShipTwosuborbital launch system. Those vehicles are taking shape at Scaled Compositesin Mojave, Calif. Along withVirgin Galactic, Spaceport America has been working with a host ofaerospace firms such as Lockheed Martin, Rocket Racing Inc., ArmadilloAerospace, UP Aerospace, Microgravity Enterprises and Payload Specialties. The NewMexico Spaceport Authority currently projects vertical launch activity toincrease in 2009 and construction to also begin in 2009 with the terminal andhangar facility for horizontal launches completed by late 2010.